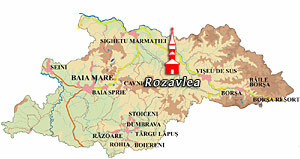 Location: Rozavlea is situated about halfway between Borşa and Sighetu Marmaţiei along the county road DJ 186. Summary: The church gives the impression of monumentality with its tall tower and its sharply pitched roof with double eaves. The polygonal chancel apse is covered with its own slightly lower roof. The Church of the Holy Archangels in Rozavlea seen from west. The entrance to the church is through an open porch on the west façade. 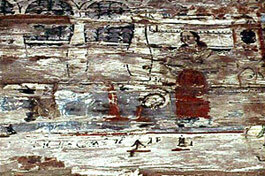 Here is found an extremely rare exterior painting, The Beheading of St. John the Baptist. 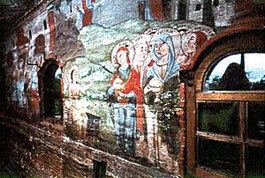 The painting is much deteriorated due to its exposure to the elements. What is mostly visible is the background of architectural drawing, with rounded arches, some red of clothing on the figures and a part of the inscription. The interior paintings were applied on a textile material attached on the vaults and walls over a preparatory layer of limewash. Ion Plohod possibly made the original paintings in the 18th century, while later works were done around 1825. The open porch on the west façade of the church. The paintings are arranged both in friezes and in individual scenes, and are painted with vivid, and often contrasting colours. The backgrounds are often fully developed scenes of landscape and compositions of western architecture, both used successfully to create a feeling of volume and depth. 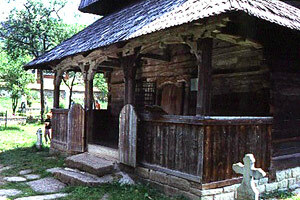 There are inscriptions in Romanian, written with Cyrillic characters. 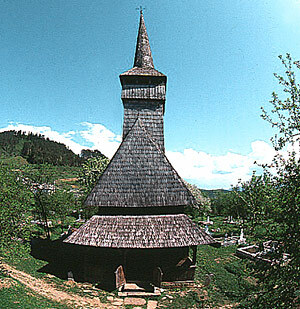 The pronaos has the usual flat ceiling of the wooden churches. The main theme, as nearly always, is The Last Judgment on the west wall, around the entrance door, and continuing on the north wall. On the barrel vault of the naos is The Holy Trinity. In the corners are the seated figures of The Evangelists engaged in writing. The lower parts of the vault show on the northern side The Ladder of Jacob and a gently undulating landscape with numerous trees. On the southern side are St. Elijah and the Chariot of Fire and St. Elisha Catching His Tunic, in the same hilly landscape. The iconostasis that divides the chancel from the naos combines sculpture and paintings in harmony. It displays the usual icons and registers of most other iconostases. During the first decades of the 20th century new painted icons were placed on the original carved wooden structure of baroque style. The chancel is a polygonal space, and in this church the ceiling is flat. On the ceiling the paintings are illegible, while on the walls the paintings have been cleaned. 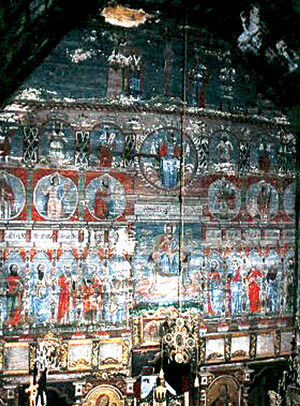 The Holy Women at the Tomb on the south wall. St. Elijah and the Chariot of Fire on the vault. 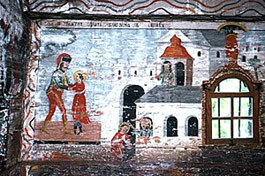 The Beheading of St. John the Baptist on the wall of the porch. St. Nestor Fighting Lie the Pagan, on the south wall of the pronaos.